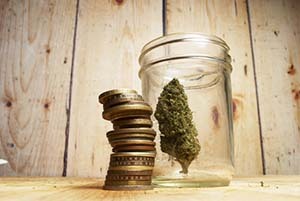 Marijuana penny stocks are handing investors triple-digit gains thanks to the emerging marijuana market, which produced sales of $6.7 billion in North America in 2016. However, investing in pot penny stocks is inherently risky. Take Novo Integrated Sciences Inc. (OTCMKTS: NVOS), for example. Between Aug. 31 and Sept. 21, the company's share price soared 253.57% from $0.28 to $0.99 in just over three weeks of trading. We don't recommend buying Novo, however, since the stock's price has already fallen back to $0.64. Investors who bought in at $0.99 are looking at losses of 35.35%. And the risks aren't just limited to volatility. These stocks can also turn out to be scams. Marijuana stocks can be risky because a majority of them trade on over-the-counter (OTC) exchanges as opposed to major exchanges such as the Nasdaq or the New York Stock Exchange (NYSE). Stocks that trade on the OTC exchanges don't have as many reporting requirements, so they are ripe for scams. In June 2017, the SEC charged marijuana company CV Sciences Inc. (OTCMKTS: CVSI) with fraud. The charges claim that both the company and its CEO, Michael Mona, Jr., lied to investors through its misleading 2013 financial reports. Throughout 2013, CVSI, which was called CannaVest at the time, was one of the top marijuana stocks to own. In that year alone, the company's share price soared 700% from $5 to a high of $40. In fact, it went even higher in January 2014, when it peaked at $69.90 per share. What happened next was disastrous. Since hitting that high in January 2014, CVSI shares have plummeted 99.67% to their current price of $0.23 per share. The June fraud charges from the SEC relate to activity during the time the company's share price shot through the roof, which is even more suspicious. Back in 2013, CannaVest announced the acquisition of a company named PhytoSPHERE systems and over-reported the value of that new venture on its financial reports. In the first two quarters of the year, CannaVest reported the value of the acquisition to be $35 million, much to the delight of shareholders. The problem is that Mona allegedly knew the value was much lower all along. In Q3 of that same year, CannaVest finally reported the true value, which was $8 million dollars, or 77.1% lower than what it had been reporting all year. Reporting the actual value was the right thing to do, but not amending the Q1 or Q2 financial reports with the $35 million figure is the equivalent of fraud. The SEC is alleging that Mona knew all along how much the acquisition was worth and reported a false figure on his company's financial reports as a means to manipulate its share price. The tanking share price after the real value was discovered shows that investors lost confidence in the stock. When a scandal hits a penny stock, it can be disastrous because these are already volatile stocks with low share prices. CVSI continues to trade today, but this could change in the blink of an eye should the company and its CEO be found guilty of the pending fraud charges. Any more negative news for this stock could send its share price to zero or even result in halted trading, which would be a disaster for current shareholders.